Dad made sure that Tess and Axel learned Finnish from their late mother’s childhood book collection, but they weren’t at all prepared to wind up with their maternal grandparents far away in Finland, visited by its mythic spirits. And the mysterious man who visits them on both sides of the Atlantic, the brown bear where none should be, and the ghost wheelchair that only Axel can see? Who could be ready for that? Visit the book’s page here on publisher’s website and scroll down to read an excerpt as you begin to discover how Tess and Axel wound up in The Winter Place. Where is the home of your heart’s memory? Book info: The Winter Place / Alexander Yates. Atheneum, hardcover 2015, paperback 2016. [author site] [publisher site] Review copy and cover image courtesy of the publisher. My book talk: Sent abruptly to live with never-met grandparents in Finland after Dad’s death, Tess and little brother Axel find themselves farther from their rural New York home than they could have ever imagined, as ghostly creatures continue to visit Axel and draw them both into mysterious places that could steal them from reality forever. Mom died when Axel was tiny, so Tess is navigating her teen years with just their offbeat professor father (who jousts at the faire each summer). Losing Dad suddenly propels the siblings to Finland to live with grandparents they don’t know, yet the Keeper who visited them in the woods at home finds them in the forest there, also. Why do ghost objects keep pestering Axel? How many times may Tess or Axel cross over that fine line between death and life? Will they be able to help Mom’s spirit find peace? The strangeness that follows them from Axel’s first sighting of the bear to the fortress ruins near a Finnish lake sets this mourning sister and brother on an otherworldly path that may not lead back to the mortal world. of course they must investigate! First of a duology, Under Their Skin should be available at your local library or favorite independent bookstore now (book 2 is scheduled for April 2017 – can’t wait!!). What indeed makes us human? Book info: Under Their Skin (Under Their Skin, book 1) / Margaret Peterson Haddix. Simon & Schuster Books for Young Readers, 2016. [author site] [publisher site] Review copy and cover image courtesy of the publisher. My book talk: After Mom’s remarriage, Nick and Eryn discover strange things about the new stepsiblings they’ll never meet, even though they live in the same town. But as the 12 year old twins start trying to find Ava and Jackson (who should go to their school, but don’t), they discover unsettling truths about what they’ve learned in school (like history being not true) and their parents (not exactly flesh and blood relatives) and the whole world (they exist because of what??!?). Why are Mom and Michael keeping Jackson and Ava away from Nick and Eryn? What is so secret that Mom can only tell them inside a snow fort during a blizzard? Is every adult in the world keeping secrets from the younger generation? 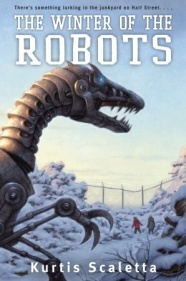 Winter of the Robots, by Kurtis Scaletta (book review) – robots good, bad, on the loose! all great until something or someone attacks them! The ‘keep out’ signs at the abandoned site are there for a reason, Jim, but staying out won’t keep the mysterious whatevers inside the fence! Scaletta wrote about the deadly snake that Linus encountered at Mamba Point – is this new snow-cloaked peril even more dangerous? Book info: The Winter of the Robots / Kurtis Scaletta. Alfred Knopf, 2013. [author site] [publisher site] Review copy and cover image courtesy of the publisher. My book talk: Metal skritching, big clawprints in the snow – the abandoned tech site hides something scarier than Jim and his friends can imagine…and it’s ready to escape! Maybe it awoke when Jim decided not to be genius Oliver’s sidekick for the 7th grade science fair. Or when their new partners’ ideas got Dmitri kidnapped and Rochelle stuck in the junkyard fence looking for otters. Or when the security cameras they borrowed from Jim’s dad spotted something moving way too fast in the Minneapolis snow to be an otter. After the creatures chase them out of the old Half Street research site, Jim and Rocky decide to send in robots with cameras to figure out what’s going on, even if Oliver won’t help.